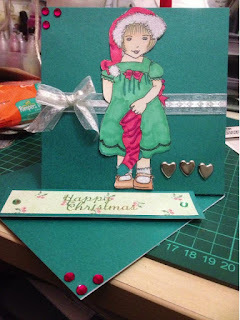 well today's challenge is a little bit of meteal at the glitternsparkle challenge blog. i have used green pearlised card and cut 5x10 inches and made the card into a twisted easel cards. i also added green and red gems, white ribbon and 3 love heart metal brads. This is so cute. Love the image. This is gorgeous Sam! I love the beautiful colour and the image is fabulous. Glitter and sparkle DT challenge lots of flowers.